The grand scheme for 2008 is to produce fabulous knitting from my stash. I have joined a trio of stash busting groups. The Ravelry Stash Knit Down 2008, Stashalong II, and Socks from the Stash equal triple accountability. On that note, I have finished a sock that should have seen completion far sooner. 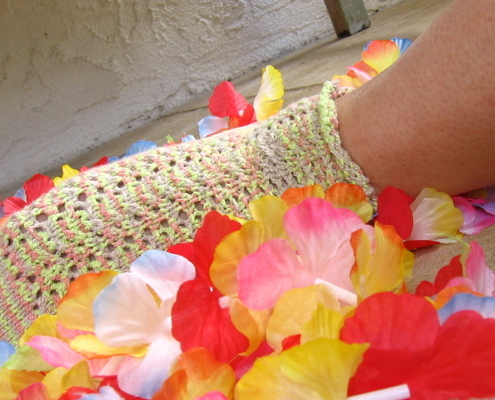 The Lacewing Fixation sock from the prodigious Hurricane Party, thrown every year by Cristybelle. I started the second sock right after Christmas while taking to the couch with a cold. 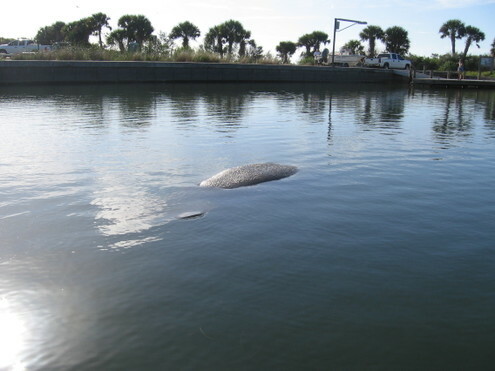 Upon near completion and my near recovery, we took the sock for a trip along the Indian River towards the Haulover Canal. 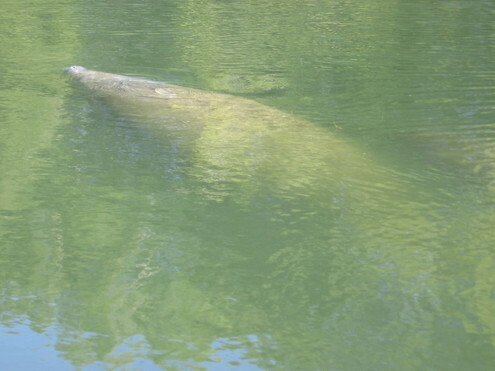 The manatees were grazing in the warm water and pelicans enjoyed the 80 degree weather as did we. I have a nice pair of anklets to start the New Year with. On the needles and, hot on the heels of Lacewing are a pair of Pomatomus socks knit using Cherry Tree Hill from my stash. I started on the Icarus Shawl using KnitPicks Alpaca Cloud that I traded two skeins of Spunky Eclectic sock yarn for. I am still plodding along on DaCapo. I can report that I have knitted the second sleeve and really just need to knit through gritted teeth. I am so close to completion. Completing this sweater is one of the goals that I have listed. There are several sweaters that I purchased yarn for in 2007. Among them are the Kauni Cardi, Sunrise Circle Jacket, the Rouge, Arwen, and the Tilted Duster. So many choices and only twelve months until another year heralds new challenges. Here's wishing every one a productive and happy new year! When you sign up to a swap, you definitely take chances that the person that you've been assigned to has a different standard of gift-giving. Thats OK. You also take a chance in that you will be left out of the process altogether. Thats OK, too. It can happen. Many feel that they've over-committed and can't quite find a graceful exit so they go underground. 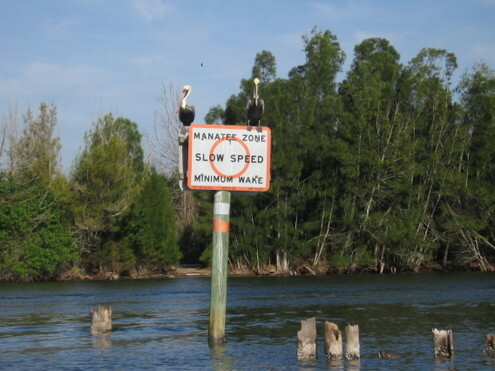 Perhaps situations at home or at work are so overwhelming and...well, we've all been there. I signed up for the Hurricane Swap Party this year. I have had two fabulous swap experiences, nay, make that three. Our fabulous swap hostess, Christybelle, was my angel and sent a box my way when my person couldn't. I arrived at my desk this afternoon and waiting in the chair was a little box. Our small office was curious. Everyone shook the wonder package, even the dog. Inside were a cavalcade of surprises. 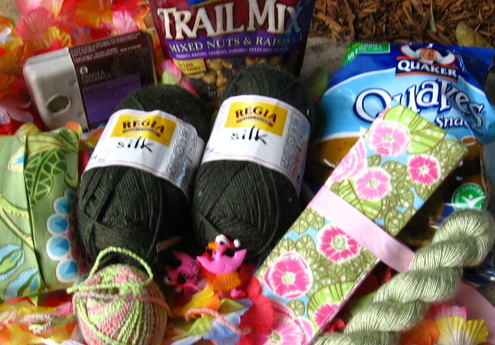 Nestled among endless leis and plucky pink flamingos were, treats to eat, yarn to knit with, needles and snazzy tissues in fabric cases (lovingly sewn), soap for the lingerie drawer, and a lacy sock. I have another WIP! Thank you ever so much for your generosity, Christy. You shouldn't have...but I'm glad you did! Forgive my tardiness Hurricane Sock Party person. Here are my answers. Short but sweet. Its not been a month for loquacious paragraphs. 2. If your pet(s) wrote a paragraph about you to describe you to us what would they say? More attention, more food, and keep the catnip in munching distance. 3. What is your favorite hurricane supply snack? 4. 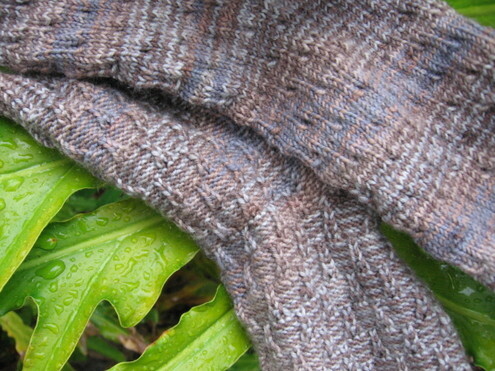 Do sock patterns normally fit you "as written" or do you usually modify them for size in any way? If I pay attention to gauge, they fit! 4a. What are your foot measurements, not just shoe size? My foot measures 8 ½”. 5. What one city abroad would you visit and why if money was no object? 6. Do you wear socks all year round or just during the winter? Do you prefer them tall or short or regular height? I have a drawer full of socks that I rarely wear. I’m a sandals and open toe shoes girl. 7. The last time the power was out during hurricane season did you knit by lantern or were you lucky enough to knit to the hum of a generator? I was blessed to knit by generator. 8. 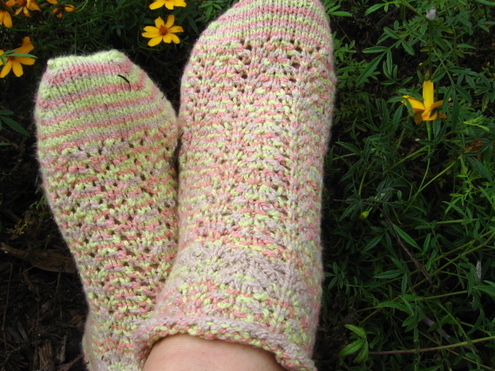 Make a wish for your favorite sock yarn that you've already used once. What would it be? I enjoy knitting with Lorna’s Laces, KnitPicks Memories, KnitPicks Gloss, Yarntini…I am staying away from the garish colors and knitting with more sedate colors these days. 9. What is it about sock knitting that keeps you wanting to knit more and more socks? 10. 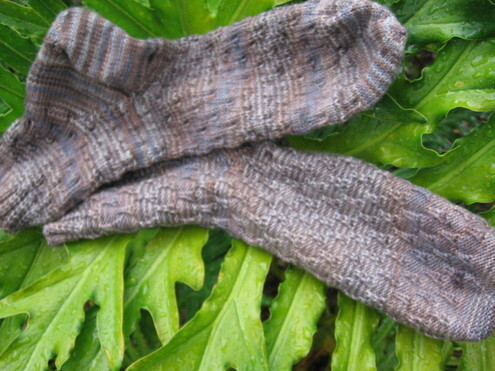 Make a wish for a sock yarn that you are dying to try but haven't bought for yourself yet. I have been hearing about Lisa DeSouza, Black Bunny, and Posh Yarns. 11. 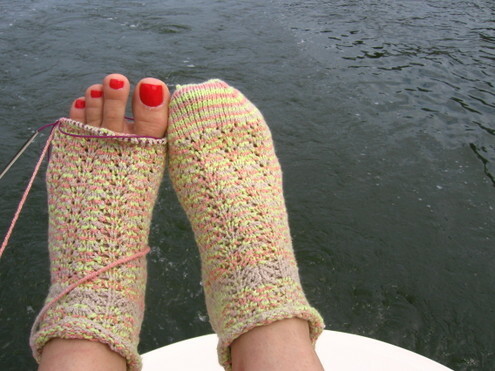 What size needles do you knit socks for YOURSELF with the most? Are they circular or bamboo needles? I favor the Clover bamboo needles and go through a lot of the size 1’s. 12. If you could only take 3 yarn related books and one previously knitted project that you love with you when you evacuated what would they be? I would take the Sensational Socks, Scarf Style, and Wrap Style books. My mohair knit throw would accompany me as well. 13. 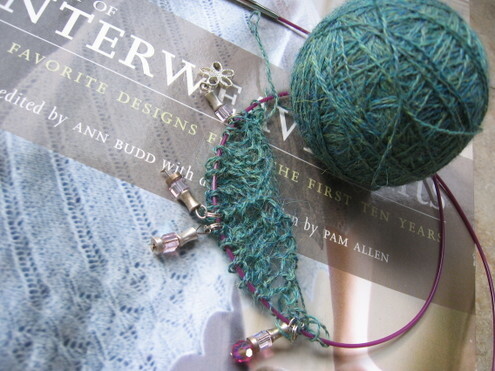 What knitting notion do you wish you had that you just keep putting off getting for yourself? 14. What is your favorite tv show? 15. Do you want a lacey sock or a "solid fabric" sock from your hurricane partner? 16. 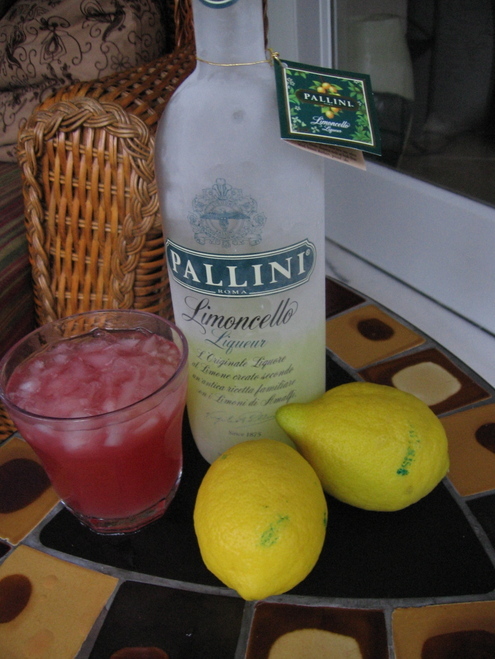 It's midnight and the power has been off for two days, it’s hot, and you have a craving for something sweet! What would it be? 17. Tell us a story about any of your hurricane weather related experiences. After suffering sleepless nights, our neighbors would gather for an early morning stroll around the neighborhood to check on others, share supplies, and remove debris. 18. What was the one thing you wish you had remembered to get last year for hurricane supplies that you swore you wouldn't forget this year? 19. What color sock would you like to receive from your sock partner? I currently enjoy muted tones.